We reopened Saint Boniface Church tonight with the Easter Vigil. I just got home to have a lamb sandwich and a beer. Sometime in the next few days, I hope to have some pictures to post. We had a fairly full house for the Vigil. If you were there, what did you think of our "new" church? My taxes weren't any harder to complete than past years; thankfully, my situation doesn't change much year to year, so I can pull out my prior year's forms to recall how I worked it out before. The city of Piqua's forms remain an obscurantist's delight. The whole thing irritates me, because what happens is folks don't even bother to fill out their forms. Instead, they go downtown, and line up, for city employees to fill them out. What a waste of valuable time on the part of our city employees, and thus tax dollars! Also, here's a lovely thing the city does. If you file your form on time, but you make a mistake, you are penalized as having not filed on time. This is true even if you overpay, and are due a refund! The penalty is deducted from your refund! Even the federal beadles don't do that! If you overpay, you pay no penalty for making mistakes on your forms. I have paid penalties twice, even when my mistake was in the city's favor! I.e., they found I was due even more money...then took part of it back. Now you understand why so many city residents have the city do their taxes. Good news/bad news: I was due a refund from all arms of Leviathan. I could have had it months ago, but various circumstances made filing my taxes sooner hard to do. Parting shot: I advocate a tax reform that no one will adopt: everyone who earns any income, however slight, should have to file a federal and state income return--and pay something. Even if you earn only $1,000 in income, then you pay...I dunno, a dime. A penny. But everyone pays something. I really disagree with past tax changes in which the pols brag about "millions of Americans are taken off the tax rolls." If all Americans had to go through the labor of filling out these tax forms, they would be attuned to questions about how simple or complex taxes are--and what's really good for the country. Also, I think it's only right that everyone pay something, even a minimal amount. Even if you get a refundable tax credit. Maybe folks could deposit their dimes at the post office. But the way I look at it, if you want the government to tax anyone's income, you should take part as well. All right, end of rant. I'm a little grouchy which is what happens when I have to bring my bricks in for Pharaoh. 1) As reported already, the ceiling and walls are finished--well, almost! We have some special touches behind several statues that we may not have finished by Easter. We did, along the way, see a need for redoing the stations, for example; but that will have to be done down the road. 2) The tile floor is finished, but it needs a good cleaning. The wood floor is (very nearly) finished: we have some edging or whatever you call it in several places to do. The vinyl flooring in the choir loft is being installed today. The carpeting for the vestibules and sacristies is about to go in. 3) The pews are all in place, and the kneelers--yes, we will have kneelers, no fear!--are being installed as I speak. The new pews are very handsome. 4) The young lady who is restoring the statues is finishing up on the Pieta and a couple of others. They'll be in place by Easter. We had a discussion about the Lord's body not looking too "healthy." 5) The altar is back in place, which is so important spiritually. I am very happy about that. 6) The sanctuary lamp is in place, but not lit yet of course; it will be lit at the Easter Vigil. 7) One sacristy has been painted; the other one, not yet. 8) The six paintings of the saints will be installed next week; the artist is back in Wisconsin, executing them. I haven't talked to him, I hope all is well with him; otherwise, that may move back a week. 9) Still a lot of stuff has to be moved around and put back in place. 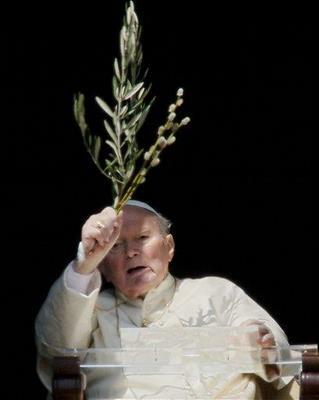 Holy Week here we come! 10) We will have the Vigil Mass here, no matter what. Saturday: the calm before the storm. I had 4 pm Mass at St. Boniface, but also had to coordinate meeting with Father Nathan, our mission speaker who was arriving "between 3 and 4" and was scheduled to preach at the 4 and 5 pm Masses, plus all Masses the next day. He arrived in time, we worked out plans for the weekend, and after preaching at the 4 pm Mass, he booked over to St. Mary to take the 5 pm Mass. That was helpful, because my parochial vicar is ill at the moment. After 5 pm Mass, we had a "spring social" at that parish, which raises funds to help students attend Lehman High School. But I had promised to take our visiting priest out to dinner; so I quickly made the rounds at the party, then the vicar and I took our visitor to dinner. That was the only time, till now, we all sat down to dinner together and about the only time I had much of a conversation with our mission priest. Sunday: I was up early, made coffee for our visitor who had a long day, preaching at 5 Masses, and offering two of them. My first Mass was 9 am, then I had noon. At 1 pm I had two baptisms; at 2 pm I was meeting with the high school students to get their input on our new, 5 pm Mass on Sunday. Between 4-5:30 I was with the junior high group, and I met with some of the 8th graders who are preparing for confirmation. At 6 pm we had a pizza party with the high school students, I stopped in there for a few slices of pie. At 7 pm our mission began, so I was in church making sure all was in order. During the talk, I heard confessions, along with our ill vicar. At 8 pm, I began exposition, for a holy hour, then back for more confessions; we concluded the holy hour at 9 pm, and Father Nathan, our mission speaker, stayed for individual conferences. Monday: my off day. I had a few things to do at the office, and then I had the mission at 7pm, same plan as the night before. Tuesday: a morning of reflection with the staff and our mission speaker, then an appointment and a busy afternoon in the office. Same plan at the mission with 2 hours of confessions. Ate dinner around 10 pm. Today: had some quiet time this morning, then an appointment; then busy day in the office. About to head to the chapel for confessions, then Mass. No Bible Study tonight, due to the final evening of our mission; but more confessions tonight. I have a penance service in McCartyville tomorrow night, and that means I can't attend the school board meeting, and I need to call the school board chairman beforehand--maybe later tonight. Oh, and I have to do my taxes. Friday I guess. 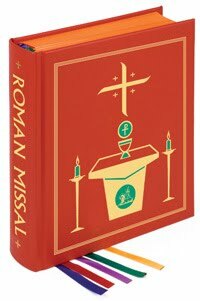 With the new, improved translation of the Mass coming this fall, I'm thinking very seriously about adding pew missalettes (may be a trademarked term by J.S. Paluch Co., I mean this in the generic sense) at the one parish that doesn't have them. This gives me the opportunity to look at the various versions of them. 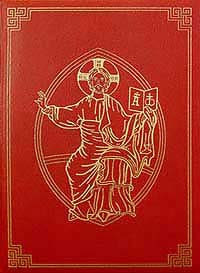 OCP: cheapest; has many options, including a Spanish mini-missal. Cover art is reasonably good. Paluch/WLP: next cheapest; cheap option has boring cover art; what we use now at one parish. Has an edition with a Spanish insert, adds $1 per copy per year. Leaflet Missal Co.: much more expensive as far as I can tell; $35 per year, not volume discount--seems geared for individual use. Ghastly artwork. No mention of anything Spanish at all. I know the Mass settings in these are usually dreadful. We never use them. But it would be nice to get one that actually had music and Mass settings we wanted to use. So...before I settle on one of these, any suggestions? Come to Piqua this weekend to hear Father Nathan call us back to the Cross of our Savior! Father Cromly has a powerful message that will speak to all hearts. He was very well received at a recent "Cast Your Nets" youth rally, and is a frequent and popular speaker at mothers' retreats in this area. Saturday & Sunday: Father Nathan will preach at all Masses (Saturday, 4 pm at St. Boniface and 5 pm at St. Mary; Sunday, 7 am at St. Boniface, 9 am at St. Mary, 10:30 am at St. Boniface, Noon and 5 pm at St. Mary). Evening talks at 7 pm Sunday-Wednesday in St. Mary Church, 528 Broadway, in Piqua Ohio. At 8 pm, a holy hour will follow, with confessions available as well as spiritual direction. Monday morning will feature a special day session on Scripture and the Mass, beginning with Mass at 8 am, followed by Father's talk. Also at Saint Mary Church. Father Nathan is a member of the Community of Saint John, which sponsors a youth program called Eagle Eye. This is not only an opportunity to strengthen your own faith, but also to invite others who need a spiritual boost. 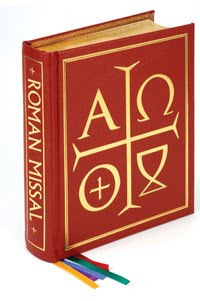 Today I was looking online for information about the new editions of the Roman Missal. As I hope everyone knows by now, at the end of November, we'll all begin using the ne w, improved translation of the Mass in English-speaking countries. Hence new Missals for church and chapel and Mass kits. Both a "Ritual" and "chapel" edition, the latter being smaller. 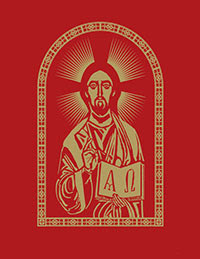 At first I was suspicious, because I assumed this would be the same Catholic Book Publishing that currently produces so many ritual books for U.S. Catholic parishes--but it's not (see information on that outfit below). All we can see so far is th e cover (at right) and a few inside pages. My reaction? The cover looks OK, the interior art looks good. What I can see of the layout looks fine, but too little to judge. Price? It's $169, but with a 25% discount if ordered by June 30. I have a ritual book from LTP, a bilingual ritual for visiting the sick. It's not bad, but could be laid out better. That makes me wonder if I'll have the same experience with a missal from LTP. The cover is, to my mind, better looking (at left). The inside art? Well, it's by Matthew Alderman, whose stuff I like--but it's executed in black-and-red, while two other publications produced full color art. I am sorry to say I wasn't so keen on this artwork. 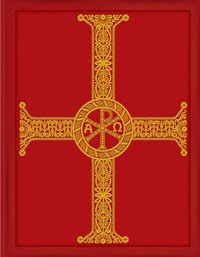 At $175, the price is slightly higher than that of the bishops, and no discount--but some discounts can be negotiated. OK, this is the one I really like. It comes in a "regal" edition with real leather and a fancy cover (who needs that?) and a "classic" edition that seems very similar, but faux leather and not as many bells and whistles. I really like the art in this one, but when I showed it to other folks in the office, one liked the bishops' edition better for that. I also like this cover best, but again, one of my employees here didn't agree (at right). How about price? Well, this is the highest: "classic" is $350; "regal" is $500. Here's the company that produces so many of the books we currently use in parishes in the U.S. Sorry to say, I hate their books. The art in them is horrible, there is no imagination or style about them--these books seem to be published by people who have no romance or poetry in their hearts. Some will say, "who cares, they're serviceable"--these are the folks who are content with gruel if it's nutritious; who cares how it tastes or smells? I know, you're thinking, that's not bad--but that's their "regal" edition. Hint: the cover is almost exactly the same as what they're producing now. Upping their game? Not so much. But wait, you say, let's look inside. I click on the link for inside pages, for typography and artwork--and what appears? That's right--nothing (if you get it to work on your browser, let me know). I don't know if they have any artwork uploaded, but they haven't posted any details on features so far. Price is $159--but no discount mentioned. I wrote this today, originally to be a bulletin item, but it grew too long. I may still insert it in the bulletin at some point. Help me edit it--let me know what you think. If something isn't clear, let me know. I get many emergency calls as you can imagine, and I witness both inspiring and heartbreaking situations, let me tell you some stories. Too often the priest is called at the last minute, or even too late. At such times, we come quick as we can and do all we can. Things can chaotic; when the patient isn’t responding, I often wonder, would this patient have had a question, or gone to confession, had I come earlier? Many times the patient receives Last Rites alone. Or, I’m called after the patient has died. Of course I come and pray—but I can’t give sacraments after death. Sometimes it can’t be avoided. But if it can, why delay? Calling the priest doesn’t mean giving up hope. Anointing is for healing—and I’ve seen folks at death’s door recover after the anointing. When things are calmer, the family can be present, and the patient can speak privately with the priest if desired. I cannot stress enough that you must be very sure the hospital has put you or your family member on the list of Catholic patients, even if you’re in “for just a day.” Things happen. Some “too late” calls are for patients who were in the hospital days, even weeks. Many priests and volunteers from several parishes visit weekly, so not only call your parish, but also tell the hospital. Be insistent; I cannot explain it, but some names do get left off. Waiting too long sometimes means it’s too late to receive communion, the most important last sacrament. I realize some patients have trouble swallowing; I can give a patient a tiny portion of the host, or even bring the Precious Blood, with a day’s notice. A hard lesson: don’t assume your family knows—or will carry out—your wishes. A man called me once to see his dad after he died. He actually told me his father wanted a priest before he died, yet didn’t call me till too late! I was flabbergasted. Don’t assume. Pick someone you trust the most and tell him or her—in detail—what your wishes are, when you can’t act for yourself. If I can help, let me know. Only some stories are so sad; others are faith-inspiring. One of the most awe-inspiring things I see is when I visit and the family is present and praying. I recently visited a parishioner who was very ill, yet hopeful. Her family was present as I anointed her and gave her holy communion. The next day it turned bad and I was called back. I anointed her again, gave her “the Apostolic Pardon,” a special blessing and plenary indulgence from the Holy Father, reserved for “Last Rites.” And with her family around her, we prayed beautiful prayers of “commendation,” invoking the saints to watch over her and to be with her as Christ called her to Himself. I told her she was “well fortified with the sacraments” and remained as her family kept praying, with her leading, until her last breath. Last Rites are more than the anointing, which, by the way, is not just for our final hours. It also includes confession, communion, and prayers entrusting our loved one to God. Many times I come into a hospital room, and I suspect things are really close to the end—but I don’t know for sure and it’s risky to assume! Sometimes the patient, or the family, may not be ready to face that reality. When the priest comes, we may be hesitant to suggest Last Rites, but if you ask, we’ll eagerly give you every consolation we can. Finally, Last Rites can be repeated—I gave my own father Last Rites three times. It can be great consolation for everyone involved. These situations are rough, emotional roller coasters for everyone involved. Your priests want to do all we can to make things a little more bearable and hopeful. Congratulations to my friend, Father Joseph Binzer, just named auxiliary bishop for the Archdiocese of Cincinnati! Father Binzer has a deserved good reputation as a hard working, humble priest who is very wise and very attentive in his many roles. He currently serves as chancellor for the Archdiocese, a position of great importance for the local church: he advises the Archbishop on legal matters, and makes sure legal matters are well handled. He is also a resource to pastors and parishes, and I can tell you when I've sent him emails or called him, he's always been very responsive and helpful. He has also served as pastor of Saint Louis Parish in downtown Cincinnati. Even though it's a downtown parish, I'm sure it still places plenty of demands on his time. Father has also taught at the seminary, and he taught me--but do not hold that against him, he tried his best! I had him for a course in canon law, and another course in business matters. As far as I can tell, he receives a lot of respect. I certainly respect him.